Former U.S. vice-president Al Gore and former Mexican president Felipe Calderon say fighting climate change will be a boon to the global economy, on the final day of the Climate Summit of the Americas in Toronto. Former U.S. vice-president Al Gore and former Mexican president Felipe Calderon say fighting climate change will be a boon to the global economy, despite critics' fears that abandoning fossil fuels will cripple world markets. On the final day of the Climate Summit of the Americas in Toronto, both tried to dispel the notion that society must choose between economic growth and helping the environment. "We're seeing in some of the states and provinces reductions in (carbon dioxide) emissions accompanied by economic growth surging," Gore told a crowd of hundreds of invitation-only delegates in attendance. "Places like B.C., California, Quebec and Ontario." Gore expanded on that point in an interview with CBC News, remarking that some provinces have been more active on the environmental front than Ottawa. "In recent years, at the national level, the reluctance of the Canadian government to really provide leadership on the climate issue has been cause for concern," Gore told CBC's Susan Bonner. "However, into that breach you see stepping the provincial governments." Calderon, now chair of the Global Commission on the Economy and Climate, echoed Gore's thoughts, saying his organization's research shows economies can grow while at the same time reducing greenhouse gas output. "Sweden increased more than 50 per cent its economic growth and reduced almost 25 per cent its carbon emissions related to 1990," he said. "For the first time in 40 years at the global level, the GDP of the world increased almost three per cent and the emissions didn't grow — in other words, we started to decarbonize the economic growth." Calderon said societies need to fundamentally change their systems; from getting away from fossil fuels, to ending deforestation, to building better cities and retrofitting aging infrastructure to make them more environmentally friendly. Earlier in the day, Gore drove his point home in an optimistic speech that only briefly touched on severe weather and natural disasters. "The thrilling news is the cost of renewable sources of energy is plummeting much faster than anyone expected they would," he said. 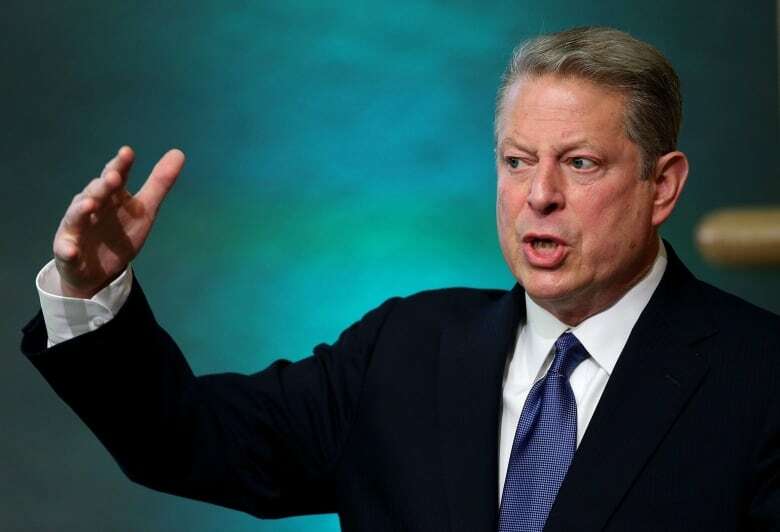 Gore laid out his speech in three parts to explain the climate crisis, answering yes to his own questions: "Must we change? Can we change? Will we change?" He added there's a "powerful voice" speaking out about global warming: Mother Nature. Gore said 99 per cent of California is in a drought, as is much of the Caribbean and wildfires across Western Canada and the United States shows society something is wrong with the planet. "Almost every night on the television news it's like a nature hike through the Book of Revelation," he said, adding that it's a "challenge to our moral imagination" to witness these catastrophic events. Gore said moving to an environmentally-focused economy will be a lot of work. For example, old buildings need to be retrofitted by installing solar panels and energy-saving windows, he said. Al Gore revealed "striking" examples of extreme climate-related conditions to summit attendees in order to show how the earth is responding to changes. (Julien Behal/AP)All that work "provides jobs, lots of jobs," he said. "And they're the kind of jobs that can't be done by robots — at least not yet." After Gore's talk, Ontario Premier Kathleen Wynne and 21 other subnational states signed a climate action statement that commits to supporting carbon pricing, meet greenhouse gas reduction agreements and ensure public reporting. Quebec, Newfoundland and Labrador, Manitoba, California and Vermont are among those who also signed the statement along with several regions in Brazil and Mexico. On Wednesday, Quebec joined Ontario, California and other subnational states after Premier Philippe Couillard signed a memorandum of understanding in a pledge to keep warming at or below two degrees Celsius by 2050.